Freedom from foot pain and many other areas of pain...it’s impossible to achieve when you’re walking, working and being active in shoes that lack proper sizing, stability and support. More comfy feet ARE possible when you visit Sole Comfort. With our Sole Comfort Evaluation, we GUARANTEE your pain relief. Don’t spend another moment of your day with discomfort or pain. Sole Comfort offers a selection of affordable footwear, preformed, customizable and custom inserts/orthotics for men and women. Although we do not have children’s shoes, we do offer inserts/orthotics for the non-adult sized foot. We do fill prescriptions for shoe modifications, orthotics and compression hosiery but do not accept insurances. Many of our services may be reimbursed by medical flexible spending plans with the proper documents. With an evaluation from Sole Comfort specialists, your shoe-insert fit is personalized. Our trained staff will listen carefully to your answers to their questions about your painful areas then inspect your feet and lower limbs, measure them and assess how they are working when you are standing and walking. Top ten reasons why you should spend money on a Sole Comfort evaluation. 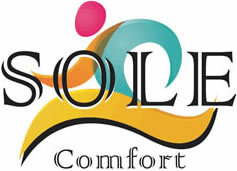 Pain relief is guaranteed at Sole Comfort. Achieving proper stability and support for your body sometimes requires an internal shoe insert/orthotic. Our specialists after proper evaluation can recommend the best type of individualized support for you with choices ranging from a preformed, customizable or custom insert/orthotic. Sole Comfort does not dispense the same type of support to everyone. Learn more about our inserts/orthotics. Sole Comfort is a Comfort Shoe-Pedorthic Facility locally owned by foot health professionals and whose staff have received specialized training to address your foot health needs.